Even the architects that create amazing homes and structures need a safe place to escape and what better way to do so than to design and build the home of your dreams for those weekends away? 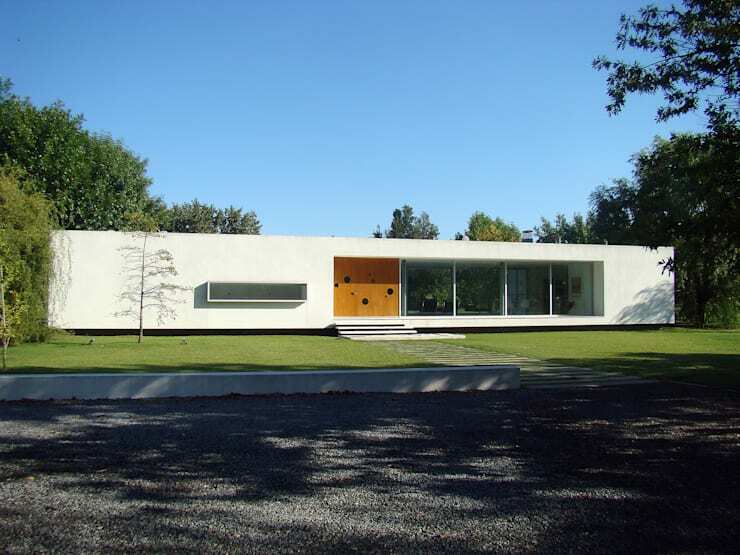 The owner of this beautiful home is none other than a studio architect at Meneghetti Architects in Argentina. 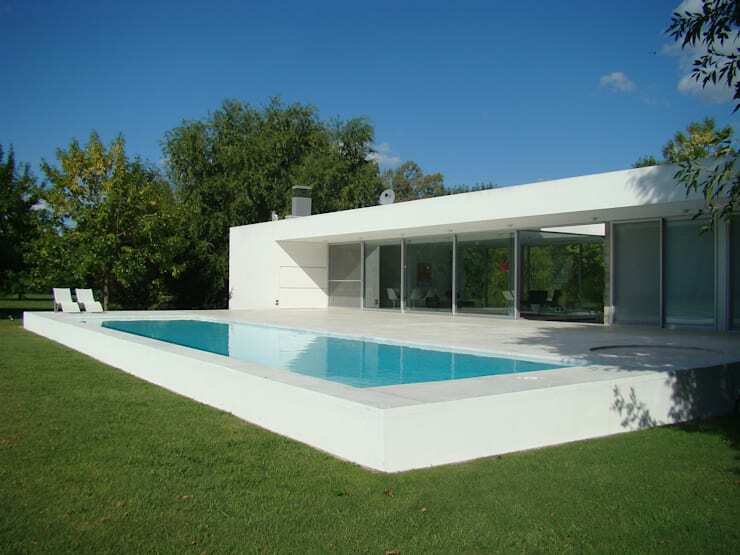 The home is located in the gated community of La Cañada Polo Club on a plot of 2600sqm, surrounded by greenery and has modern charm and minimalist qualities. The one-storey villa occupies about 200sqm and consists of a courtyard, garden, dining and living rooms, as well as kitchen. It also has an office and master suite. The villa was completed in 2016 and took about twelve months to build. It is really an amazing sight. 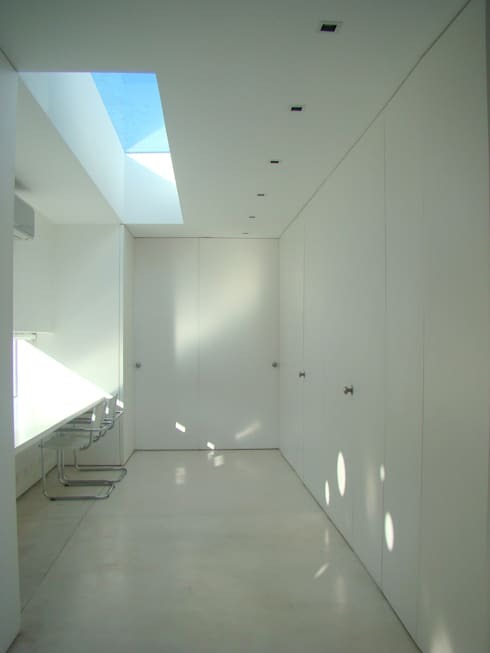 This beautiful house maintains clean lines and an all-white façade for true modernity. It is surrounded by lush greenery for ultimate relaxation and has a calming effect. This bright unit has a manicured lawn that becomes an extension of the interior at the rear of the home. While the subtle shade of trees makes this villa comfortable and serene by shielding it from the harsh sun throughout the day. A dream home such as this can only be thought of by an architect. The magnificent view and modern, minimalist features of this home makes it the perfect place to be after a tough week at work. The living room space is large enough for a positively fantastic social experience,. Entertaining family and friends in your own home has never been this fabulous! The living room has a bright atmosphere as a result of the large windows allowing natural sunlight into the space. The space is decorated in neutral tones with light grey flooring, a small coffee table, black sofas and chairs and adding a touch of vibrancy to the room is the addition of the red rug.Simply stunning! And how about the view of that swimming pool? Open plan living spaces are becoming more and more normal in this modern age, but who wouldn't want to include a reading corner that is perfect for that time of solitude? The corner is complete with comfortable chair and an elegant modern lamp that revives this old fashioned value of a good book, while looking great at the same time. 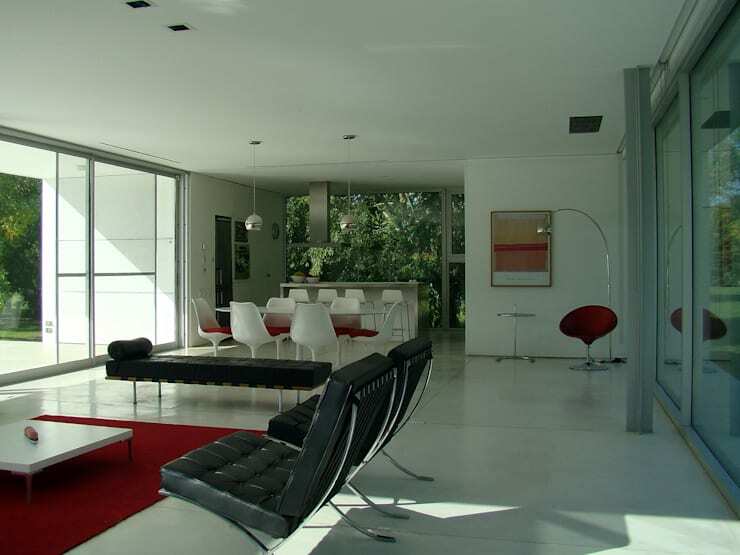 That red chair and chrome reading lamp certainly blends in well with this open plan space! No kitchen is complete without that personal touch and here the kitchen certainly has all its bases covered! 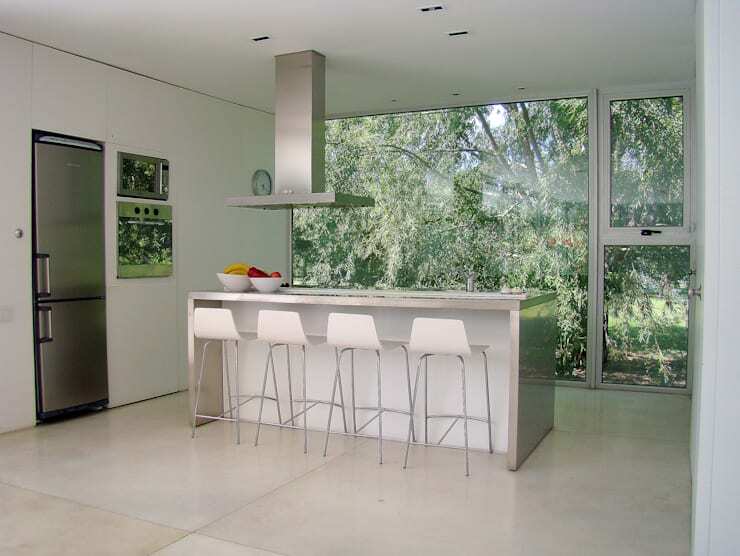 This elegant and sleek designer kitchen exudes minimalism with its all-white and silver décor and designer appliances, which are tucked away in the wall. The modern kitchen is an extension of the open plan living space but that doesn't make this culinary area look any less amazing. That large window behind the kitchen counter creates the perfect appreciation of the surroundings, adding an almost picturesque atmosphere to the kitchen and a touch of greenery as a backdrop. A home office is often that dreaded place that you have to include in your home in order to complete your work, but that doesn't mean your office needs to be disorganised and piled high with paperwork and admin. A clean and clear home office such as this will ensure that your work gets completed with simple and elegant décor included for inspiration… especially helpful if you are an architect. If you need some more home office design ideas, have a look at these: Cool Ideas For Home Work Spaces. A vacation home without a swimming pool would be incomplete. A beautiful pool adds that perfect element of relaxation and fun for the whole family. Just imagine spending time in the great outdoors with a place to cool off on those hot summer days and nights… wonderful! This turquoise pool surrounded by green lawn and trees is truly a slice of paradise!